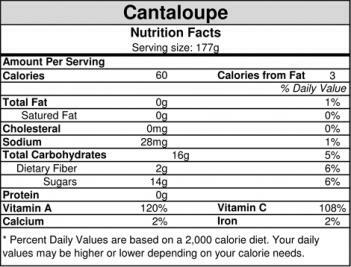 Cantaloupe is low in saturated fat and sodium and very low in cholesterol. 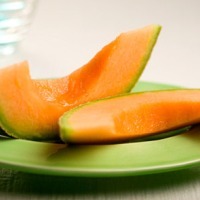 Cantaloupe is a very good source of Vitamin A and C and Potassium. It is also a good source of dietary fiber Niacin, Vitamin B6, and Folate. Folate is necessary for the production and maintenance of new cells which is very important during pregnancy and infancy when cell division is rapid. 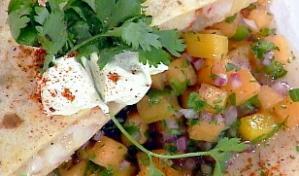 Combine the fruit, onions, jalapeno, and cilantro in a mixing bowl. Season with salt and pepper. Add the lime juice and olive oil. Mix well. Set aside. In a saute pan, heat the oil over medium heat. Add the onions. Season with salt and pepper. Saute for 2 minutes. Add the garlic and shrimp. Season with salt and pepper. Continue to saute for 2 to 3 minutes, or until the shrimp turn bright pink. Remove from the heat and cool completely.